Mark Selby is within one frame of the World Championship semi-finals after claiming eight frames from nine in his second session against Alan McManus. The 2007 runner-up extended his 4-3 morning advantage to a 12-4 lead with breaks of 86, 109 and 74. "The O'Sullivan-Murphy match is over as far as I'm concerned. You have to win the first session to have any chance against Ronnie and Murphy has missed it. 'The Rocket' is not going to play that badly for the rest of the match. 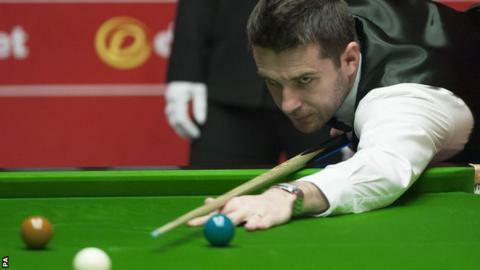 "'The other players are not playing their natural game against Ronnie. They are basically scared of him. It is a great feeling, I have had it myself, when you know someone can't beat you. Ronnie has that with most players at moment." Last year's beaten finalist Barry Hawkins is also in control, leading Dominic Dale 11-5, while Judd Trump has a 6-2 advantage over Neil Robertson. Champion Ronnie O'Sullivan hit breaks of 136 and 94 to lead Shaun Murphy 6-2. Before his meeting with O'Sullivan, Murphy, 31, described his opponent as a "genius", and he had no response as the five-time champion found his rhythm late in the first session of their quarter-final. They will resume at 10:00 BST on Wednesday, with Selby set to pursue the single frame he needs on the other table. The 30-year-old former world number one started Tuesday's evening session with a break of 86 and McManus was left to rue a missed brown in a close ninth frame that allowed his opponent to clear to the pink for a 6-3 advantage. A disjointed 12th-frame win by McManus aside, Selby dominated to move close to his first Crucible semi-final since 2010. Should he progress, he will meet England's Trump - if the 24-year-old can replicate his first-session form against Robertson, who remains on 99 centuries for the season. Trump, whose biggest win came at the UK Championship in 2011, ran off breaks of 107 and 117 to set up his four-frame advantage. Dale - playing in his first World Championship quarter-final since 2000 - produced a number of errors against Hawkins. The world number four duly took advantage to turn the 6-2 first-session scoreline into a five-frame lead before breaks of 88 and 67 - either side of a Dale's win in frame 15 - secured a six-frame overnight cushion. If Hawkins completes the win on Wednesday, a repeat of last year's final meeting with O'Sullivan is possible in the last four.